A good marketing strategy basically has the shelf life of a frozen turkey. Sure, you can still eat it after 18 months, but it's going to be less than fresh and hardly optimum. Did you wake up this morning, pour your coffee, think about work, take a deep breath and say to yourself “I am killing it!”? Or maybe you didn’t wake up to trumpets sounding your sheer awesomeness. Maybe your first professional thoughts were accompanied by a foreboding sigh of concern…. Well, don’t worry. You’re possibly better off than the guy who woke up singing his own praises. To have a title like mine (with “Strategist” as your primary noun), you have to be slightly impressed by your own intelligence. We suffer from Smartest Person in the Room Syndrome and we love to impress people with our strategies… especially ourselves. The REAL issue is that my strategy, your strategy, the one you completed last week, the one you have labored on with intensive competitive analysis and market research, the one you are currently executing, the one that is growing revenue and securing your bonus…is already outdated. The ugly truth is that the beautiful, comprehensive documents that we spent time, talent, and treasure to deploy need to be shredded regularly. A good marketing strategy basically has the shelf life of a frozen turkey. Sure you can still eat it after 18 months, but it’s going to be less than fresh and hardly optimum. In my last article, I had the sheer audacity to tell you that you probably don’t have a marketing strategy. Worse yet, I placed you into four categories: Strategic, Tactical, Active, and Reactive, a.k.a. the STAR Spectrum. The STAR Spectrum details the various elements of an effective digital marketing team and highlighted what was needed to be operating at a strategic level. If you know you don’t have a marketing strategy stop reading this article and go HERE. A few people probably read it, checked their boxes, and felt pretty good about themselves. A slightly larger group read it, realized they had a few things left to learn…but still felt pretty good about their strategic functionality. This article is for you guys. This guide will show you how to keep your strategy fresh and firing on all eight cylinders. The points I’m going to focus on in this guide are not challenging or difficult. There are some abstract ideas at play, but any marketer will understand the why and the how. The challenge is going to be getting your organization on board and growing an environment that will nurture your strategic edge. He was commenting on the nature of impermanence and flowing change as the basic law of the cosmos. It’s an elegant summary of something that is vast, complex, and meaningful. It is truly a great idea that I view as a canon law for modern business and marketing strategists. Nothing stays the same. The pace of business moves too fast. Technology is always breaking open new frontiers and in a global business environment, like the web, competition can come from anywhere at anytime. The nature of the game is volatility. Just consider how Facebook and Mobile have changed the strategic environment in the last five year and you’ll know exactly what I mean. That is why your digital marketing strategy is only good for 3-18 months at most. A new competitor, product, channel, technology, algorithm, litigation, and a shift in public relations. These are just a few elements that can drastically shift your ability to generate real revenue and take the wind out of your strategic sales. The idea of recreating a comprehensive, effective strategic foundation every three months is enough to make any marketing vice-president go grey. You would spend all of your team’s efforts and resources on planning and have zero left over for execution, which is obviously untenable. Let me stress that, IT IS BEST to throw your strategy out the window and start from scratch every 18 months. Think of it as programming a new operating system or adding on to a building. Sure you can patch new functionality on old features, but you may be asking for trouble and inviting bugs into your system. At some point, you need to start fresh. A new digital marketing strategy every 18 months is more realistic and a bit more palatable, but how do you keep it relevant during that year and a half between builds? Well, if you build it intelligently, with agility at its core, it can remain relevant and effective throughout that period. This is accomplished via constant revision, the willingness to admit error, and embracing an iterative approach. You need to make the shift to considering your strategy a living, potentially flawed, document. It needs to change, it needs to have flexibility built in at its core, and most importantly it can’t be viewed with reverence. It has to be accessible to your ground troops and they have to have the courage and the support to make changes without fear of shaking the status quo. Your strategy is your most important marketing investment and it should guide every effort, but it will only thrive and evolve in an environment that is conducive to its health. Your organization and team are an incubator for your marketing ideas and execution and there are a few factors to make your organization strategy-friendly. First and foremost you need to commit yourself to the investment in time and resources needed to keep your strategy relevant. These resources change based on the level of detail needed, but I’ll give you some guidelines based on my experience and how the UHURU team works. When we start a digital marketing Strategy Engagement or a Business Advantage program for a client we anticipate a minimum of 60 hours of work to get a detailed, comprehensive, executable strategy document built out. That is using our cross-functional consultants and experts, who do this a lot. So based on your team’s level and capability you should probably plan on an investment of 100 hours. You will also have an investment in technology. This would include your marketing automation system, CRM, data collection, and monitoring tools. Most organizations reading this article will already have those in place, so I won’t break out costs, but assume a decent Marketing Intelligence and Communications Technology Stack will probably run about $2-5k monthly. That is your start from scratch, build it from the ground up, time and technology committee. But how do you keep it fresh in the interim? Make your strategy accessible to everyone via your shared folders or your project management system. Have people track their changes, but encourage your marketing team to update the document when they see something relevant or encounter a macro or micro environmental change. Then, schedule some time to revisit and update. At least one to two times a month schedule an hour or two for your team to review the key points and compare them to the current environment. Discuss what is working, what isn’t, and track changes. Then, at least once per quarter schedule a more detailed review that pulls in your executive team, product development team, customer service, and sales groups. Plan on an hour per conversation, and then plan on four to five hours to update the document and seek feedback. Sacred cows are the enemy of a healthy strategic marketing environment. Every idea needs to be subject to review, deep evaluation, and potential annihilation. On the best marketing teams, the ones that are generating predictable, repeatable, scalable results, there isn’t a tactic that can’t be improved or a preconception that shouldn’t be challenged. Foster an environment and a team that is always questioning, evaluating, and willing to speak truth to power. As a leader, be willing to put your own initiative on the chopping block. Ask your team to evaluate and debate your ideas, tactics, initiatives, and product. It’s easier said than done and if your team is hierarchical or fear-based, you’ve got a long road ahead of you…but you probably wouldn’t have made it this far if that were the case. 3. Encourage experimentation and risk, within reason. Intelligent, researched, reasonable experiments are the best friend of high-functioning strategic marketing teams. I don’t need to tell you NOT to bet your entire budget on a new channel, but DO encourage your people to lose a little bit of money on a new idea. Set 2% of your monthly ad budget up as a throwaway. Let your people try their new idea and don’t worry about the loss. Now, that doesn’t mean to throw quality out the window. Insist that those experiments look professional and make sense. Ask for research and a plan…but say yes. There are endless tools out there to encourage and enhance experimentation so take advantage of them. The next big win may be sitting inside a junior member of your team, so give them room. Start small, lose small, and scale up the wins. Agile, Kanban, and Scrum have long been the realm of effective software developers and annoying consultants who love to throw around business bingo words. Not to be one them, but it really is a great working model for high-performing marketing teams. The benefit of Agile is that you can turn on a dime, and create CHANGE. The fact that you have a fluid backlog, dialog with the executors and a changing prioritization model mean that the distance between a micro/macro change and your team responding intelligently is only as long as the sprint. Your response time is one week to days vs. one month to a full quarter. You can deprioritize and move your pieces to where they can affect revenue FOUR TIMES in the course of a month. That is a huge advantage. Better minds than my own have gone into depth on the Agile Advantage for high-functioning marketing teams HERE… definitely worth reading. Up until this point, my focus has centered on the WHYS and HOWS of keeping your marketing strategy relevant. Good stuff, but not as important as the WHATS. Conceptual ideas around creating an environment and facilitating understanding of the mechanisms at play doesn’t cover what exact elements are needed to keep your strategy from going flat. There are various tools and tactics, but they fall into three alliteratively pleasing categories of: Education, Evolution, and Enhancement. The best marketers I know strive to, and succeed at, maintaining a Student’s State of Mind. They continually seek new information, new methodologies, and new understanding. They are aggressive about their own training and constructively critical of their own abilities. The old mantra of Do-or-Die has been replaced by Learn-Unlearn-Learn-or-Die. You know how every company loves to say “our people are our greatest asset”? Similarly, education IS your competitive and strategic edge, so don’t be afraid to admit that there is something you DON’T KNOW. Be aware of your own knowledge gaps and work to close them. Seek out online classes and seminars: Hubspot, Marketo, Google, LinkedIn, Facebook, and just about EVERY other advertising platform or marketing tool out there have classes and certifications available for you and your team. These classes can occasionally be limited in scope, so be cautious, but they are almost always worth your time. Learn new tools: A new tool or tactic can push your team. Recently the UHURU team became interested in online AI chatbots and CTA tools like snip.ly. We read up, watched videos, played around, deployed, optimized, and developed expertise. Then we want back and updated our strategy to put them in play. Voila, new skill sets, new tactics, new competitive and strategic advantage. Tap into other industries and departments: I’m willing to bet you have a few trade magazines in your lobby. They are usually kept on hand to hold down the coffee tables and show off your relevance…but you don’t read them of course, because you’re in the industry and who has time. Right? Sure. So go get some other industry’s stuff. If you’re in SaaS check out Marketing, if you’re in Education check out Business, if you’re in Marketing read a tech journal. Or at least reach across the company and read something that is relevant to Customer Service, Sales, or Accounting. We are all caught in the microcosms of our own environment. We need to break that mold and seek new ideas. Send your team members to a conference…or at least a webinar: Many companies don’t have the budget for a lot of travel, but in today’s virtual world there is no excuse. Keep your team on a path of continual education and have them share what they learn. For example, one of our artists went to Adobe MAX, she came back with enhanced skills, a ton of excitement, and some valuable tips…FOR OUR SALES TEAM. In addition to training, the other major aspect of education is your intelligence machine. The best marketing groups don’t just monitor statistics or KPIs; they monitor intel and build detailed, effective Marketing Intelligence systems that keep them in deep contact with their environment. This kind of educational tool can be daunting and time-consuming, but the trick is knowing what to look at, what to respond to, and what to ignore. Focus on shifts, trends, changes, disruption, new launches, and bad or good reviews. Craft a task list and create a template of how you want the pertinent data presented. The idea is that a junior-level marketing coordinator can update aspects of it six to eight times a month with about 2 hours of work. You’ll want to spend some time with it every week and make your own updates as well. How a species evolves determines its adaptation and survival in a changing environment. Evolve correctly and you thrive. Evolve inappropriately, too slowly, or not at all, and you die. The same is true in digital marketing. All the aforementioned education and marketing intelligence will create data that you will need to sort, process, and gauge if it needs to be addressed strategically and in what timeframe. Assuming you’ve been able to sift this information and identify the issues and opportunities, how do you respond and how does that affect your strategy? Won’t analysis paralysis stifle your productivity? Basically, data presents you with two options, evolve your strategy and tactics, or ignore and continue. If your marketing machine is working, the question of whether you decide to evolve or ignore should be based on simple prioritization. Some businesspeople like to pretend that prioritization is difficult. It isn’t. Just consider two factors: Impact on Revenue vs. Impact on Perception. Those two factors are actually all we are responsible for as marketers. We control perception and its impact on revenue. Every piece of data can be judged and prioritized based on how it falls on the matrix. Please note that only Priorities One and Two are addressed at a strategic level. Priorities Three and Four can and should be addressed tactically or not at all. For example, if you learn that your competitor is preparing a disruptive product that rivals your own primary offering for launch in the next quarter, that is high impact on both cost and perception and needs to be prioritized as #1 and addressed strategically ASAP. If you learn that your traffic from a smaller social channel has the potential to grow 2% if you optimize it, that would obviously be a lower impact to both perception and revenue and should be put in the backlog to adjust tactically. So you need to take everything you learn via Education and decide to Evolve or not. But there is one more tool to aid you in maintaining strategic relevance. Enhancement is the final part of this equation. We’ve discussed how education is key for your strategic edge and how to address issues of when and how to evolve your marketing strategy, but Enhancement is the force of constant improvement within the confines of your existing strategy and timeframe. This is working out with better form, for better gains, not changing your entire workout routine. This is admitting that you might not be the best at something you’re good at, and deciding to become better. Just because a tactical methodology is fleshed out in your strategy document, and is meeting goals, doesn’t mean that you shouldn’t be pushing it to work better and/or faster, and be more. It seems odd that I would even need to say this, given that we are marketers and we are working to improve campaigns constantly, but some organizations can’t see the open air above their own KPIs. There are a few things that make enhancement possible, I’ve already covered a few of them in Creating a Strategy Friendly Environment, but the biggest is deciding to make your marketing performance revenue-based. That’s right, abandon your precious percentages and ratios and focus on the impact to revenue. This simple change will modify your entire outlook and show you the opportunities to enhance and improve your tactics. Revenue-based marketing is unnerving because there is nowhere to hide poor performance. It all comes back to the bottom line. It gives you a hardline awareness of when something is working. If revenue improves, you’re enhancing things correctly. If revenue declines, make adjustments and try again. Don’t think that a loss is always a bad thing. 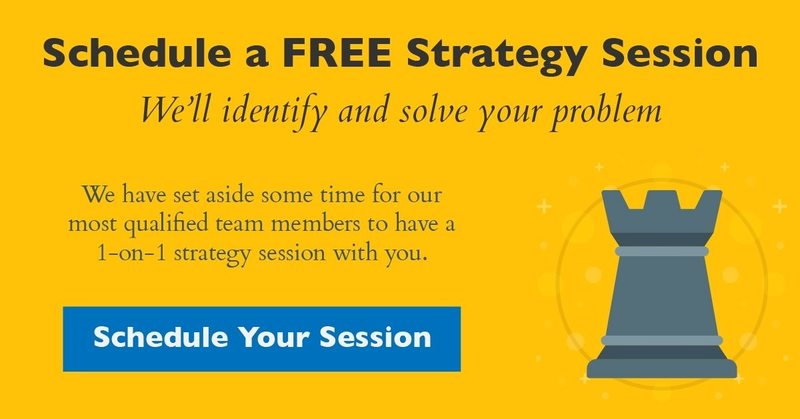 Sometimes losing out on a campaign or tactic is an amazing learning experience that will allow you to hone your strategic edge. I’ve covered a lot of ground in this guide. We’ve discussed the need for strategic revision, creating a team that embraces change, and certain tools for keeping your marketing strategy relevant and effective. There is one more topic to cover, and it’s a difficult pill for a lot of marketers. That is: When to Seek Help. We were all hired for our knowledge, so admitting that we don’t know the answer, or need help is difficult. Recognizing and closing your gaps is a challenge. The tools and tactics I listed here require an investment of time and money. You need your team to learn, you need people to experiment, you need to fail, analyze, and improve. Truthfully, not every marketing team has the opportunity, time, or bandwidth to get it all done. The best teams are aware of that and bring in experts to help improve their strategy, analyze their tactics, and improve their performance. Actually—and I’m sure this is no surprise—that is what we Business Strategists do. 18 months sounds right to me. Some business which have seasonal cycles (a sunscreen distributor, for instance) will probably have natural planning periods each year, so the 18-month cycle may not work well. They wouldn’t have time in the summer. So, would you recommend 12 months or 24 in that case?